Sarcomas are heterogenous, and accurate diagnosis is a continual challenge. What’s needed for a better diagnosis is a multidisciplinary approach considering integration of morphology, immunohistochemistry, and molecular genetics. Accurate classification of diagnosis is key for appropriate decision making. In the case of GIST, if we know the exon sub-type, then that provides more information for the clinician on how to properly manage and treat the disease. There is continuing debate about the appropriate length of adjuvant treatment, and decisions may vary from country to country. In most cases, patients are given adjuvant imatinib for up to three years (perhaps longer, especially for patients with ruptured tumors). However, in the United States, the drug label does not specify the length of time for adjuvant treatment, and it is generally up to the physician’s discretion. Some physicians may prescribe lifelong adjuvant imatinib therapy while others may be more selective. Some physicians believe that lower-risk patients can safely continue with monitoring only (no adjuvant imatinib therapy). For higher-risk patients such as those with a tumor rupture, physicians may prescribe lifelong adjuvant imatinib. Much depends on how aggressive the tumor is and on the location of the primary tumor (for example, higher risk for small bowel). Health insurance/ drug coverage will also be considered. 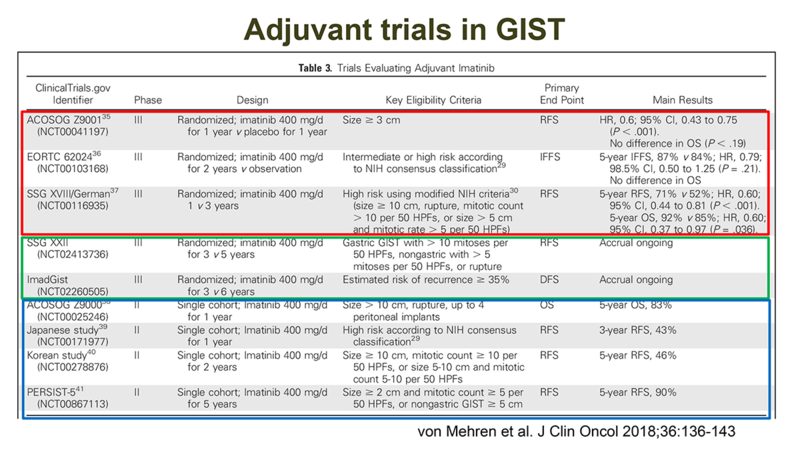 There are some ongoing clinical trials of adjuvant therapy in GIST – see Figure below. 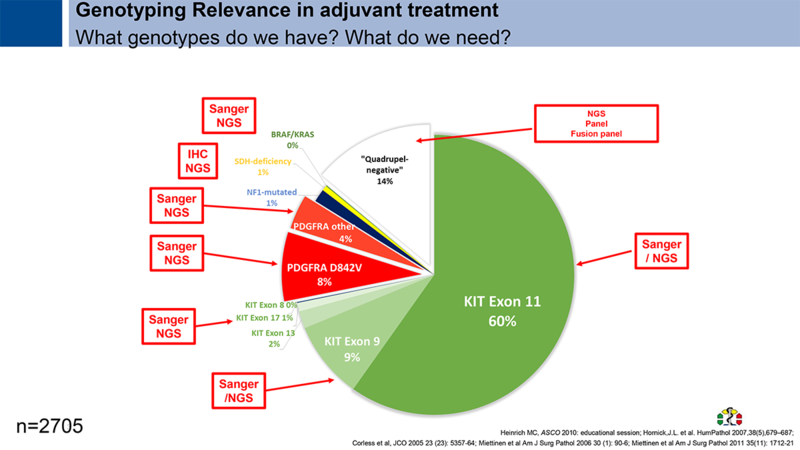 Currently there is a multi-center study taking place around Europe looking at 3 versus 5 years of adjuvant imatinib therapy for high-risk aggressive GISTs. The results will not be available for a few years. The bottom line is that this decision should be made following a conversation between the physician and patient, considering the benefits and risks of adjuvant therapy. According to Dr. Peter Reichardt, one of the top GIST experts in Germany, surgery is recommended when the patient is responding to adjuvant treatment and there is an opportunity to resect all of the tumor. Subsequently, the patient should continue drug therapy. Preoperative drug therapy may provide the possibility of reducing the morbidity of surgery, e.g., less blood transfusion. Imatinib inhibits (blocks the activity of) the KIT enzyme (receptor tyrosine kinase) that drives most GIST tumours. However, secondary mutations often arise, leading to imatinib resistance. This can happen because imatinib no longer binds effectively to the altered KIT enzyme. KIT activity resumes and the tumor may progress. Secondary resistance can occur because of various secondary mutations. Most commonly, imatinib-resistance mutations affect one of two sites in the enzyme, referred to as the “ATP-binding pocket” and the “activation loop”. Changes in the structure of these parts of the enzyme can prevent imatinib from binding, and if imatinib cannot bind to the protein, the drug becomes ineffective. In many cases, second- or third-line drugs may still work. When a secondary resistance mutation occurs in the ATP-binding pocket (exons 13 and 14), imatinib is usually no longer effective, but sunitinib may work. Secondary mutations altering the activation loop (exon 17) are usually resistant to both imatinib and sunitinib, but may respond to regorafenib. The standard second-line therapy, following progression on (or intolerance to) imatinib remains sunitinib, with individualized dosing and scheduling. However, ongoing trials are comparing new drugs “head-to-head” against sunitinib (second-line) and regorafenib (third-line), so we need to continue to monitor developments. 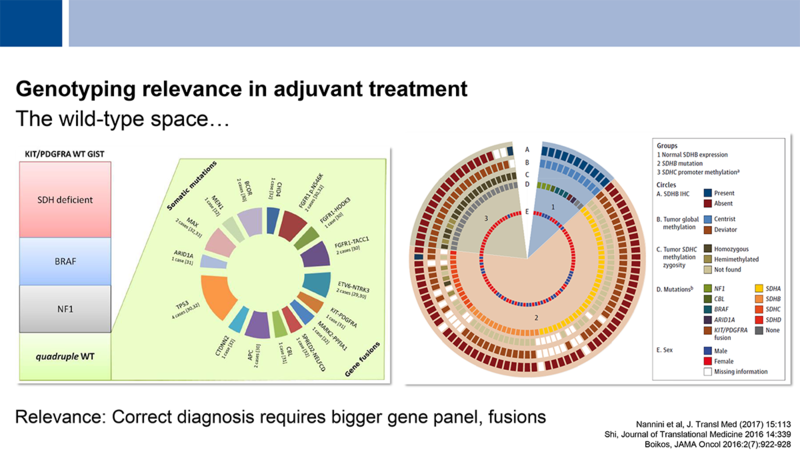 To summarize Dr. Reichardt, metastatic GIST is like a mosaic, where the original KIT mutation has been “painted over” with additional secondary mutations. He feels that it is important not to stop treatment altogether, even after a patient has failed all three approved drugs. Even in this situation, the drugs may have some benefit, stopping at least some of the tumor cells from growing. It’s still better to give imatinib than to do nothing. Patients should have options for entering clinical trials or, in some countries, trying “off-label” drugs. This is not optimal but it can at least slow down the disease. The experts recognize that there are clinical situations where tumor genotyping is worthwhile, although understanding continues to evolve. There is increasing evidence that genotyping can indeed be prognostic, i.e., the type of primary KIT mutation in the tumor may predict risk of progression for patients with localized disease. Regarding adjuvant treatment, the risk of choosing treatment is toxicity (and cost), and the risk of no treatment is possible loss of efficacy. Genotype information may influence this choice. For example, genotyping can identify tumors that have mutations in PDGFRA rather than KIT. Some PDGFRA mutations are sensitive to imatinib but most are resistant. So, identifying PDGFRA mutant tumors may reduce the ineffective prescription of imatinib. Some novel drugs, now in clinical trials, target specific mutational sub-types. 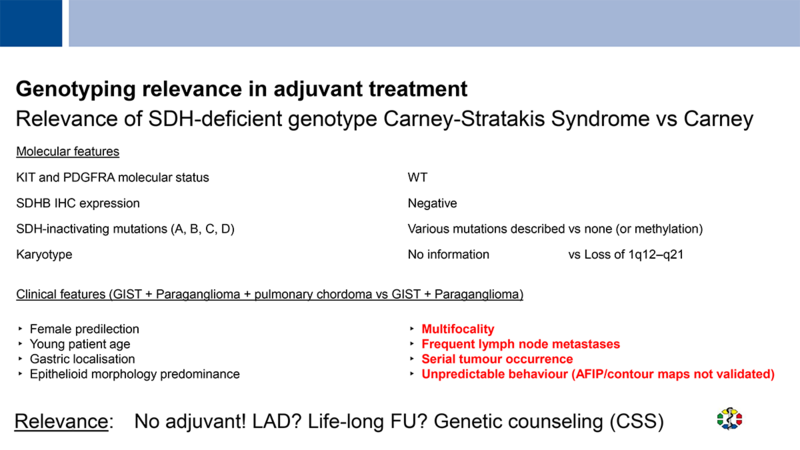 For many years, we have referred to GIST tumors that do not carry mutations in the KIT or PDGFRA genes as “wildtype”. “Wildtype” is the term that geneticists use to refer to a normal (not mutated) form of a gene. 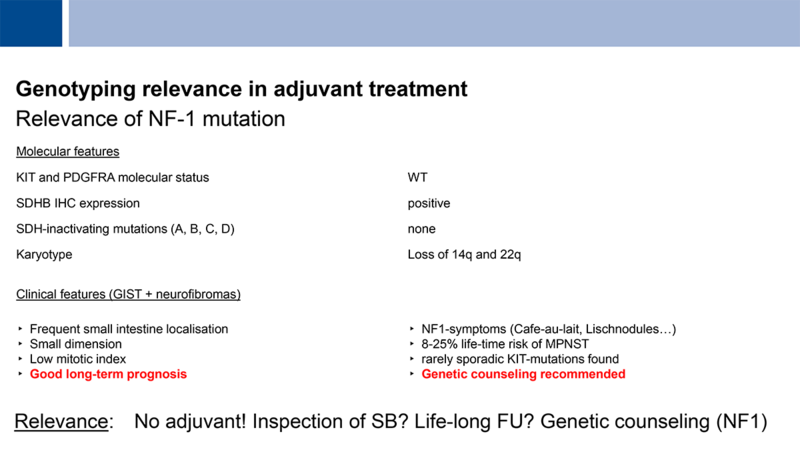 However, we should no longer use the term “wildtype”, because many additional mutations in GISTs have now been identified; these are rare but real sub-types of GIST, and include “SDH-Deficient”, “BRAF”, and “NF1”. When none of these genes has an identified mutation, we can refer to “quadruple-negative” GIST (following the terminology used in breast cancer, “triple-negative”). There is a consensus among the expert medical community that physicians should avoid prescribing adjuvant imatinib treatment for GIST patients with NF1 or SDH-deficient GIST. Genotyping should be standard work-up for all GIST cases! Also, the genotyping should be performed by an experienced reference pathologist. The relevance of genotyping for refractory GIST remains unclear. Both of these conditions can be associated with paraganglioma, pheochromocytoma, and some other pathologies. Clinical evidence indicates that large resection of these GISTS is not necessary and does not benefit patients (no increase in event-free survival). Surgical procedures should be limited to patients who have symptoms such as pain or hemorrhage. It is important to follow these patients after surgery with annual whole-body MRI (without contrast) and pharmacological screening (catecholamines). The terminology “wildtype GIST” should be abandoned; particular mutations should determine the natural history, type of surgery, type of treatment, screening and follow-up. According to Dr. Jonathan Trent, doctors should be performing next-generation sequencing in all GIST cases. If no mutations are detected, patients should be evaluated for possible gene translocations (this is how NTRK fusions are found). It is also important to do immunohistochemistry staining for SDH and a molecular evaluation of the SDH pathway. If no mutations are revealed, the GIST should be called “GIST-NOS” (no mutation detected) or “genotype unknown”. In his opinion, there is no role for the term quadruple (or quintuple, etc) wild-type GIST. Patients often have challenges finding treatment options in their own country. For those looking for clinical trial options, we recommend visiting gisttrials.org, which is a global directory of GIST trials and also includes access to data generated from the trial. If patients do not have access to trials or have run out of options, some companies may have compassionate use programs to assist them. Please contact Sara Rothschild at srothschild@liferaftgroup.org for more information. One of the major takeaways from this meeting is that patient groups need to work together with the clinicians and pharmaceutical companies to get the right screening, treatment, and follow-up, in order to further improve GIST treatment.